Almost every fantasy story I've read deal with fight scenes in one of two ways. The first is to make it a spectacular show, with special moves, acrobatics, magic, powers and other feats thrown around to dazzle and impress the reader. The second is to describe the battle in broad strokes, seeking to capture the spirit, the energy, the tactics and strategy, and the drama of the clash without delving too deeply into the mechanics of each technique. Unfortunately, they don't work for me. The first approach is rather common -- but unfortunately, many writers aren't martial artists and don't consult martial artists in their writing, and it shows. From improbable feats of strength and skill to overuse of dialogue, poor tactics and mindset to amateurish behaviour, the scenes grind at me. It's violence for the sake of violence. It doesn't reflect the sheer intensity and chaos of combat, or show how humans are both incredibly resilient and incredibly fragile in battle. 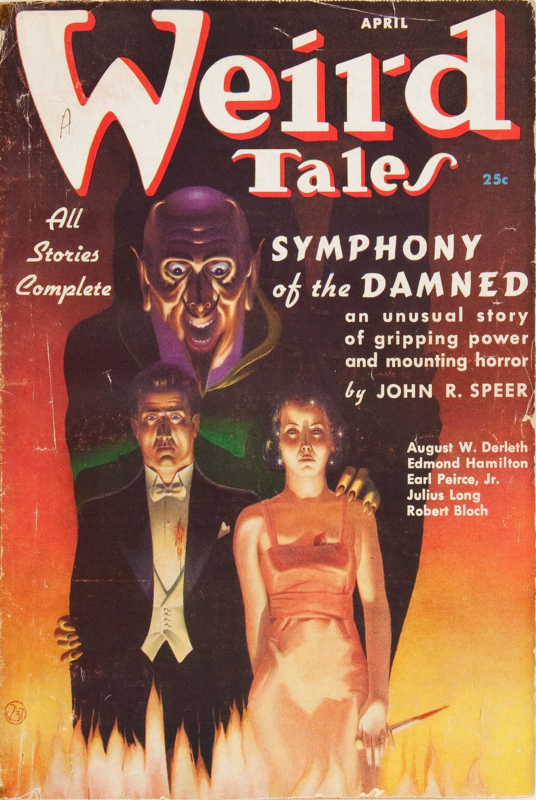 The second approach tends to be more common among the older pulp masters, such as Robert E Howard. The great advantage of the broad strokes approach is that there is less room for technical errors, and the ability to cover a longer period of combat without fatiguing the reader. However, if the perspective narrows down to the actions of a single character on the field, the reader will pay close attention to what he does. If the author missteps and writes in an error, the reader will surely notice. Things like swords cleaving clean through mail or a character swinging a sword with all his strength jump out at me and pull me from the page. And, yes, not even a master like Robert E Howard is immune to this. As a result, I find myself skipping fight scenes all the time. The second I see something that doesn't work, my brain kicks in and points out the error. If it happens too many times, I'd rather skip the sequence entirely than subject myself to such interruptions -- and waste my time on scenes I don't enjoy. In combat-heavy stories like Berserk, this means skipping through 70% to 90% of the story. Or more. I want my readers to get the most enjoyment out of the time and money they invest in my stories. Thus, I take the third option: authentic combat techniques, adapted to the setting. In Dungeon Samurai, fantasy monsters and realistic combat is the name of the game. I wanted to represent the classical Japanese martial arts, especially Kukishin-ryu, to the best of my ability, and I wanted the samurai to do battle with hordes of terrifying monsters. This is how I adapted koryu to the dungeon. When designing monsters, familiarize yourself with their anatomy too. Understand the placement of their vital organs, the range of motion of their limbs, and the locations and capabilities of their sensory organs. In combat, vital organs are primary targets. Joints can be manipulated, locked or destroyed to manipulate a target and degrade his capabilities. Wounding and destroying sensory organs also reduces a character's ability to fight. Every character in a fight scene would prioritise these targets -- and strive to protect their own. if your story has monsters or characters with unique physiological traits. make full use of them in a fight scene. The mole men in Dungeon Samurai have long, powerful tentacles from their snouts, and will use them in close quarters to grapple with a soldier or break his neck. Huge monsters may try to crush someone under their bulk, while monsters with acid spit will attack characters at a distance. Each monster should have a distinct fighting style that allows them to make use of these advantages. Set up the fight scenes so that they will have an opportunity to employ their natural weapons -- or have characters take precautions to nullify these advantages before a fight. If you employ actual martial arts in your story like I do, take the time to understand and employ the signature techniques and concepts of the humans' fighting styles. 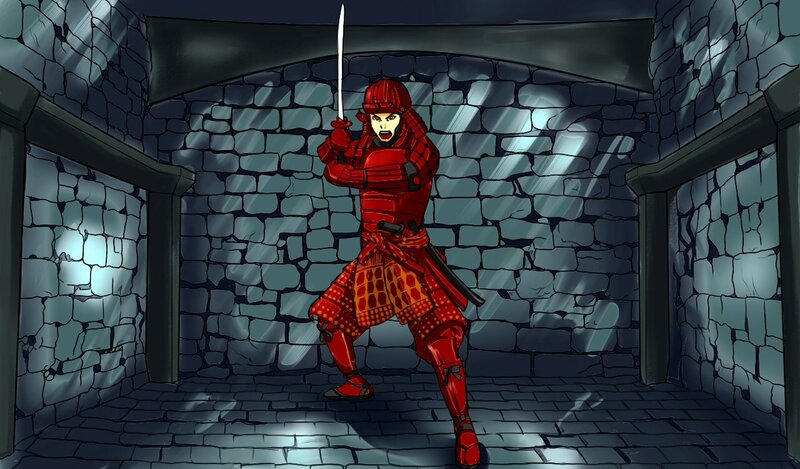 The hero of Dungeon Samurai uses Kukishin-Ryu, a classical Japanese martial art. One of its signature moves is a sudden drop to the knees and an upward slash to the groin or thrust to the throat. The change in levels allow a person to dodge a high line attack without stepping off-line, critical in a cramped environment where you can't sidestep (like a dungeon). The simultaneous strike comes in from below a person's visual cone, preventing the enemy from seeing it and reacting until it's too late. In the dungeon, this technique shows up in combat where appropriate. Speaking of koryu in general, there tends to be an emphasis on lethality and efficiency. Grappling techniques are designed to lock a target and expose his vital organs for a stab, break a limb, spike his head against the ground, or all of the above. Footwork tends to be deceptively subtle, just enough to reposition yourself without appearing to have made a significant displacement. Older koryu schools also teach the use of weapons for grappling, above and beyond simply slashing, stabbing or striking the opponent. These concepts also show up many times in the dungeon. Different arts have different tactics, techniques and concepts. Understanding them, and employing them in a story, goes a long way towards creating an immersive experience. If armour is present in a scene, it must serve to protect the wearer. Ineffective armour is merely decoration -- and a waste of money and materials. In the real world, once armour-penetrating firearms were commonplace, armies discarded body armour completely. Armour must be relevant in a scene, beyond simply showing how skilled or strong a character is. Armour influences how characters move and act. Armour instills a sense of confidence and decisiveness in regular soldiers. The weight and construction of armour restricts how far and fast someone can go. If anti-armour weapons are present in the setting, the characters will gravitate towards them, which in turn decides what techniques and tactics they will use. Samurai in armour are trained to move in specific ways to minimise exposure of the openings in their armour, while armored combat techniques are meant to break open the opponent's guard and expose those openings. Armoured samurai may look awkward and rigid in motion, but the techniques are undoubtedly effective in bypassing armour. Once they engage the enemy they usually stab or slash an opening, disrupt his balance, throw him down, or a combination thereof. In the same fashion, monsters will protect themselves using their armour, and use anti-armour techniques. Armored melee combat is highly technical, but also highly rewarding. With two armored men wrestling with each other, seeking out each other's weaknesses, you have plenty of opportunities for reversals, tactics and surprises -- and with them plenty of opportunities for drama. The characters must draw on the depths of their skill, experience and cunning to survive. I find that far more rewarding for the reader than simply having someone add more power to a blow. In Filipino Martial Arts, practitioners assess weapons by their properties, for these properties tell you how a weapon can be used. A sharp edge is for cutting, a point is for stabbing, a long shaft gives you reach and can be used as a lever or to assist in grappling, a guard protects your hand, and so on and so forth. When writing a fight scene, take full full advantage of a weapon's properties. In Dungeon Samurai, the humans rely on three main hand weapons: the jumonji yari, a spear fitted with a crossblade; a tanto, or dagger; and the sasumata, best described as a spear fork. In addition to slashing and stabbing, a jumonji yari's crossblade can entangle an opponent or trip him - or cut his knee tendons from behind. A tanto is a last-ditch close quarters weapon, which, among other things, can be used to cut a mole's tentacles off you before the monster breaks your neck. Sasumata usually fulfill the role of the iconic 10 foot pole from Dungeons and Dragons: the samurai use them to sweep for traps and tripwires. However, the wide fork can be used to jam an enemy's limb or pin him against a wall. A weapon's form tells you what it can do. Adapt these to the threats appropriately, and incorporate them in tactics. Fights occur in time and space. It's not enough to adapt techniques to the monsters -- you also need to take the environment and tactics into consideration. Anywhere a fight takes place, there are always opportunities to take advantage of the environment. For both sides. One of the reasons I chose samurai as the main characters is because koryu isn't well-suited for the tight confines of a dungeon. For instance, when grappling with a monster, if you perform any kind of over-the-shoulder throw, you're throwing the monster into your buddy behind you or to the side. Your buddy won't appreciate it, and you've just opened a hole in your formation. Likewise, if you try to throw a monster onto his back, the monster behind him will prop it up. Right off the bat, this negates a large number of textbook moves. The environmental restrictions forces the samurai to either pull the enemy down and into them, or to pin them against a wall and stab them. In addition, koryu training is highly focused on individual combat, but survival in the dungeon demands fighting in tight formations. This negates all techniques that require fancy footwork or side steps. When monsters with armour or unusual physiology and abilities show up, the samurai must work to expose their weaknesses and prevent the enemy from using their advantages, while still maintaining their formations. By using classical martial arts in a setting poorly suited for it, the characters must constantly think and adapt to whatever they face. The monsters, too, will adapt. This creates an innovation cycle for both parties in-story, fueling an immersive experience for the reader, and introduces novelty to what would otherwise be by-the-numbers fight scenes. This may seem extremely technical, and indeed, if you delve into the mechanics of every technique, it will. Above all else, don't forget that the point of doing all this is to maximise reader enjoyment. If it's not fun to read, if the writing is too focused on dry technical aspects, the reader will lose interest. You're not writing a textbook on how to fight fantasy monsters. You're writing a story about humans fighting fantasy monsters by using their skills, experience and smarts. The little details and mechanics don't matter so much as the characters involved. Readers are far more interested in human struggles, the constant innovation, and the sheer desperation of a fight. This, above all others, is the most important element when adapting real-world fighting techniques to a fantasy setting. Want to see these fight scenes in action? Back Dungeon Samurai here!